On February 05, 2018, about 2352 local time, a Sikorsky UH-60M helicopter, NA-706, operated by National Airborne Service Corps. of the Ministry of Interior, Taiwan R.O.C., went missing and is presumed to have crashed in open ocean waters shortly after departure from the Lanyu Airport (RCLY), located on Orchid Island, Taitung, Taiwan. Of the six occupants on board, the three crew members and three passengers, remain missing, and the helicopter is presumed to have been destroyed. Salvaging the wreckage of a UH-60M Blackhawk helicopter that crashed last month while transporting a patient from Orchid Island (Lanyu) could take two to three months, Aviation Safety Council Chairman Hwung Hwung-hweng told lawmakers yesterday. Hwung was at a meeting of the legislature’s Transportation Committee to brief it about the council’s plans for this year, but Democratic Progressive Party (DPP) Legislator Cheng Pao-ching brought up the effort to salvage the National Airborne Service Corp helicopter. 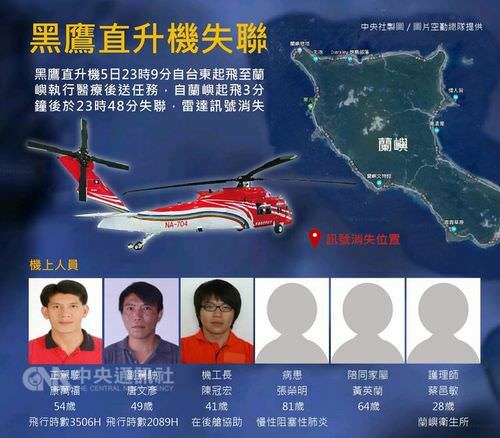 The helicopter disappeared on Feb. 5 after taking off from Lanyu Airport on Orchid Island with six people aboard: three crew, an emergency medical technician, the patient and a family member of the patient. Their bodies have not been found. Hwung said the council has detected wreckage in the sea and the Ministry of the Interior, which overseas the corp, has hired a contractor to salvage it. The salvage operation could take two to three months, he said. The wreckage was located 1,000m below sea level and special equipment is needed for such a recovery operation. “It would be difficult to twist and maneuver the cables to retrieve the wreckage under such great pressure,” Hwung said, adding that Japan and Singapore have the technology needed to salvage wreckages on the high seas. It is not clear whether Taiwanese operators could manage such an operation, Hwung said. DPP Legislator Lin Chun-hsien said that the government should acquire the capacity to conduct high seas salvage operations. As Taiwan is surrounded by sea, aircraft are more likely to crash on the water than land, he said. Cheng also suggested the government move Lanyu Airport from the northwestern half of the island to the east. Aircraft departing the airport often need to deal with wind shear, he said. The airport is also not equipped with auxiliary facilities to enhance nighttime visibility, Cheng said. The Civil Aeronautics Administration needs to address such safety risks, Cheng said. The investigation team conducted two batches of the underwater recorder searching operations from February 14 to February 16 and February 18 to February 21. The investigation team confirmed the signal of the recorder was continuing to be sent. The investigation team carried back a piece of wreckage with dimension 60 by 45 centimeter picked up by a civilian from the Lanyu Island beach and another piece of wreckage with dimension 210 by 80 centimeter recovered by a fisherman from sea near the Green Island. The aforementioned wreckages were part of black hawk helicopter’s main rotor pylon sliding cover and broken left cargo door respectively. On February 5, 2018, the National Airborne Service Corp, Ministry of Interior, conducted an emergency medical service flight with an UH-60M Black Hawk helicopter, O registration number NA-706. The helicopter carried 1 patient, 1 family member of the patient, 2 flight crewmembers, 1 mechanic and 1 nurse, total 6 persons on board. At 2349, the helicopter took off from Lanyu Airport to Taitung (Feng Nien) Airport and lost contact with the control tower three minutes later. After Aviation Safety Council (ASC) was notified, an investigation team was assigned immediately to Lanyu Island to launch investigation and assist search and rescue. When investigation team arrived in Taitung on next day (2/6), due to poor weather conditions, all sea and air transportation to Lanyu Island were suspended. The team is heading to Lanyu Island and has coordinated the Coast Guard Administration, the Executive Yuan for supports to search the underwater flight data recorder Today(2/8) . According to Aviation Occurrence Investigation Act, the ASC had determined the event as an aviation occurrence. An Investigator-in-Charge has been assigned to this investigation. The investigation team had accomplished the initial investigation planning including personnel organization and equipment requirements, witness interviews, air traffic radar data calculation, occurrence site area hydrological data collection, flight data recorder underwater search planning and maintenance record collection, etc.